WHAT DOES THE TERM “BIAS-TYPE” BUFF MEAN? Zippo™ metal hub, cloth buffs are manufactured using highcount, heavyweight, industrial type cotton sheeting. Before this cloth is assembled into a buff, the fabric is first biased so that the woven threads are at a 45º angle to the periphery. This prevents cross threads from pulling out, it reduces fraying and raveling, and creates less buffing dust debris. The sectional view of figure No. 1. Illustrates how each individual thread in a bias-cut cloth buff is locked in as it travels from its anchor point at the buff hub to the outer surface. Wear occurs only on the ends of the cotton threads which cannot pull or rag out. Compare figure No. 1 with the sectional view of the conventional type buff in figure No. 2. Note how readily the short cross threads at four different points around the circle can be frayed and pulled out of the weave of the conventional buff in figure No. 2. WHAT ARE THE ADVANTAGES GAINED BY BIAS CONSTRUCTION? Prolongs buff life by greatly reducing fraying and raveling. Result: less buff cost, a cleaner operation, and buff change “down-time” is reduced to a minimum. A Zippo™ puckered face, with its many folds, heads up with a larger quantity of buffing compound and retains it longer. This reduces buff wear and compound consumption. A Zippo™ puckered face cross buffs the work surface and provides a uniform buffed surface, free of buff separation streak lines on the work piece. The ventilated steel center forces a constant stream of cool air between the buff sections for rapid heat dissipation. Result: a cooler operation; permits higher speeds and wider buff working faces; eliminates buff burning and scorching; produces cleaner and finer finishes with fewer passes. Compensating density is built in: The hardness increases as the buff diameter is reduced through wear. This effect offsets the reduced efficiency that normally takes place at lower surface speeds when conventional buffs are reduced in diameter. Result: a consistent and uniform rate of “cutting and coloring” right down to the buff hub. Built in resiliency and flexibility are inherent with bias constructions. Result: Zippo™ Buffs flow easily into, over and around irregular shapes and surfaces. Extra thickness – Zippo™ Buffs are twice as wide as conventional type buffs. Result: you need only half as many sections for the same working face. Perfectly Balanced and Trimmed. Result: All Zippo™ Buffs are ready to mount on the spindle for immediate use. It is economical to produce and to use and it performs extremely well on most buffing operations. It is available in a wide selection of diameters, plies, cloth counts and densities. WHAT ARE THE DIFFERENCES BETWEEN BIAS CUT BUFFS? 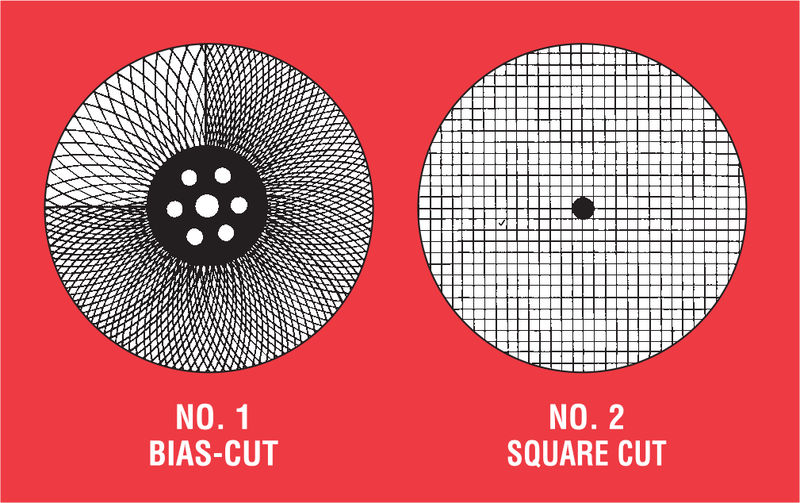 While there are an infinite variety possible “Bias Cut” constructions, industry’s normal requirements can be accommodated with basic densities called, medium duty and heavy duty . The apparent differences are created by the varying yardage content between each type. As the yardage content is increased it folds and compacts more solidly at the buff hub – forming heavier pleats that carry on out to the buff face. Obviously, the greater the yardage content – the greater are the number of pleats formed – and consequently – the harder the buff face becomes. Since the buff is the carrier for the buffing compound, which actually does the cutting – it is apparent that the aggressiveness of the buffing action and the life of the buff are directly related to the density of the buff face. In general, the high count and heavy weight 86/93 unbleached cloth is preferable. If additional buff stiffness is desired, specify 86/93 yellow treated cloth. The lower count and softer 64/68 sheeting is recommended only for mild cutting or high color buffing operations.